There were no footsteps, there was no noise, but in the middle of a field of the town of Malabrigo, Province of Santa Fe, local residents were startled by imprints that appeared in the area, and logically, led them to think of an extraterrestrial phenomenon. A little over a year ago, strange circular marks were found in a field some 8 kilometers from the city. The phenomenon has now repeated itself in a wheat field and only meters away from the town. There is no explanation. The fact is that the strange "drawing" managed to startle residents of Malabrigo, who want to solve the riddle amid their astonishment and uncertainty. 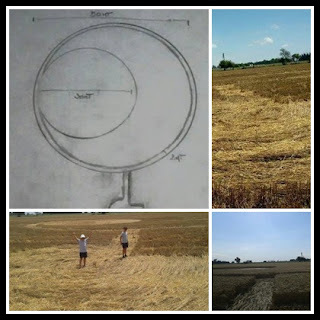 According to the VISION OVNI web site, the drawing, which appeared on Saturday, November 7 at 1000 meters from the home of Mrs. Gloria Pinatti, presents a 50 meters outer circle, a 30 meter inner circle, and a 2 meter wide edge. Spain: Not a UFO, Just "Space Junk"